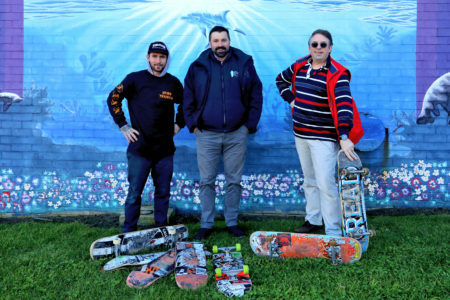 On Thursday 5 April, Darren White, Principal of Baseplate conducted a community consultation around an updated Currie skate park design. The design offers increased functionality and safety and suits a range of abilities and disciplines, including skateboards, BMX and scooters. The consultation session aimed to provide an opportunity to hear directly from the designer about the proposed improvements and give the community an opportunity to provide input into and suggested adjustments to the design. Skater and specialist builder Steve ‘Shoota’ Kelly was on the Island from the start of May to undertake the much-anticipated upgrade. In the process of adding some basic building blocks to our skate park, Steve, who has had over 7 years specialist building experience, hoped he was able to impart some of this knowledge to those who want to skate them as well as build they own elements into the future.